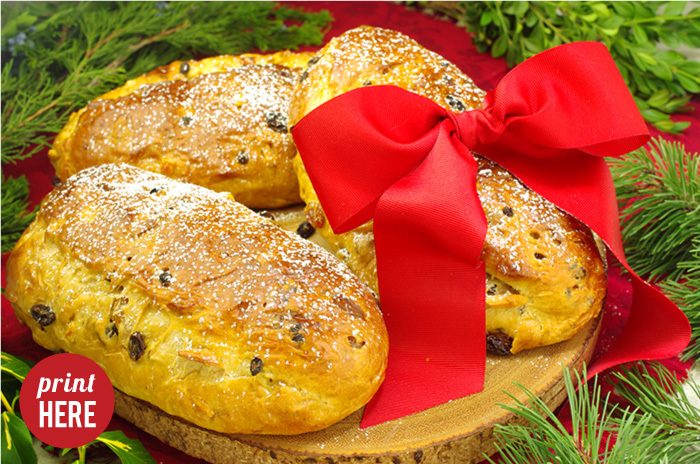 Stollen is a Christmas spiced bread originating in Germany that’s loaded with dried fruits and filled with a thick layer of marzipan. 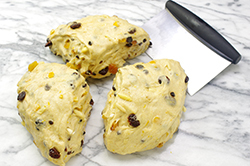 At this time of year, with numerous gifts to think about, it makes perfect sense to double up on your baking, especially as you’ll never be short of worthy recipients. 1. 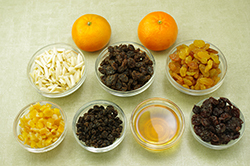 Place the raisins, golden raisins, currants, peel and cherries in a medium-sized bowl. 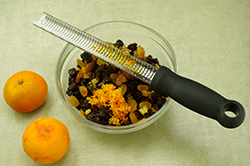 Add the clementines or orange zest and juice and the brandy and leave to soak for an hour or so until the fruit has absorbed almost all of the liquid. Add the chopped almonds and mix well. 2. 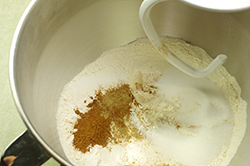 Sift the flour, salt, mixed spice, ground cardamom, and superfine sugar into the bowl of a free-standing electric mixer equipped with a dough hook. Warm the milk, add the active dry yeast and stir well. 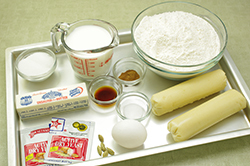 Set aside, until the yeast has formed a thick foam on top of the milk (5-10 minutes), then add to the dry ingredients with the softened butter, vanilla and the beaten egg. 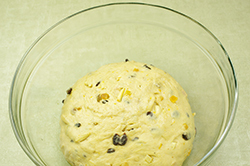 Knead the dough in the mixer for about 5 minutes, until smooth. 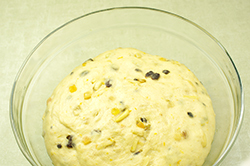 Add the soaked fruit and nuts and mix again, until evenly distributed throughout the dough. 3. 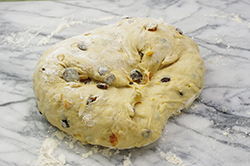 Turn the dough out onto a lightly floured work surface and shape into a ball. Place in a large, clean bowl, cover with plastic wrap and leave in a warm, draft-free place for at least 1 hour, or until doubled in size. 4. 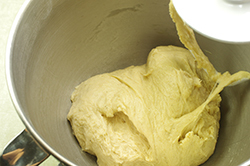 Turn the dough out onto a lightly floured work surface again and knead lightly for 1 minute. Divide into three even pieces and roll each piece out to the size of a rectangle, roughly 8 x 6 inches (20 x 15 cm). 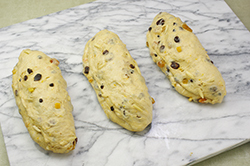 Divide the marzipan into 3 even pieces and roll each one into a log 6 in. (15 cm) long. 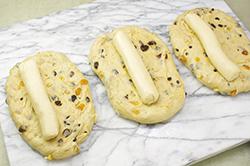 Place a marzipan log just off the middle of each piece of dough, brush the edges with a little milk, then fold the dough over the marzipan and press to seal. 5. Arrange the stolen on nonstick baking sheets, cover loosely with lightly oiled clingfilm and leave in a warm, draft-free place until doubled in size. Preheat the oven to 350°F (180°C). 6. 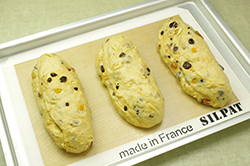 Bake the stollen, one at a time, on the middle rack of the preheated oven for about 25 minutes, or until risen and golden brown. Cool on wire racks, then dust liberally with confectioners’ (icing) sugar before packaging into cellophane packages tied with festive ribbon. 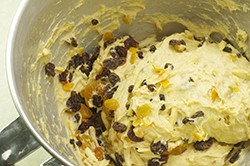 Stollen will keep for a week or so if wrapped well in foil or in a tin and is delicious warmed and sliced for breakfast. Reprinted with permission from Gifts from the Kitchen by Annie Rigg. Copyright 2011. Published by Kyle Books, Lanham, MD.